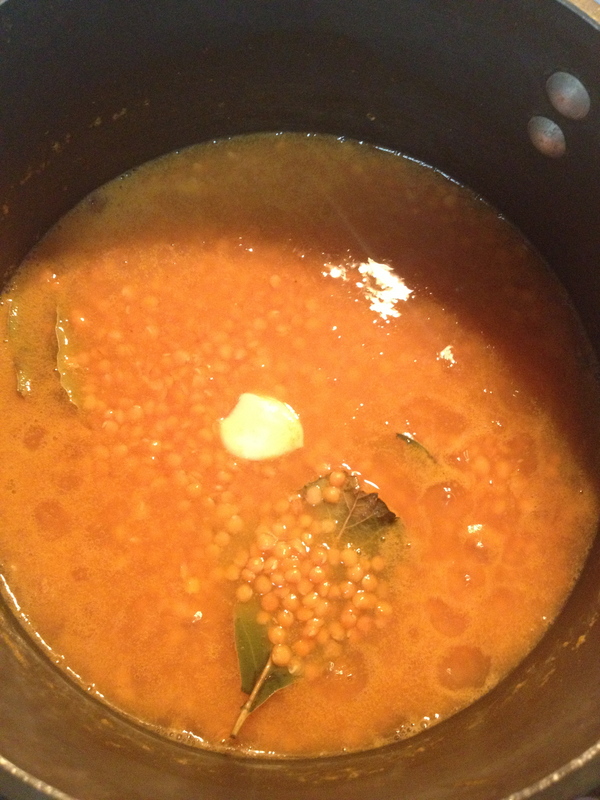 I’ve had lentils sitting in my pantry for a long time. 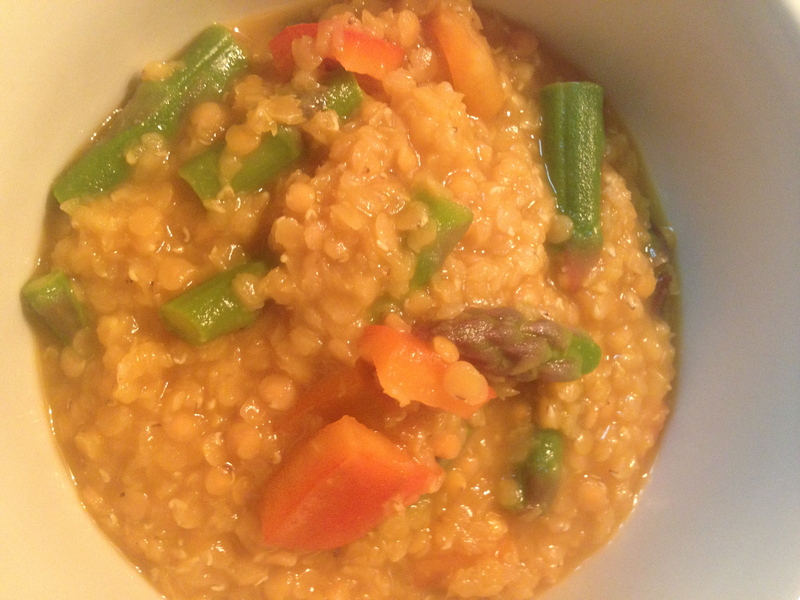 Last week, I need a quick, easy and nutritious meal to take to work with me so I decided to give them a try. 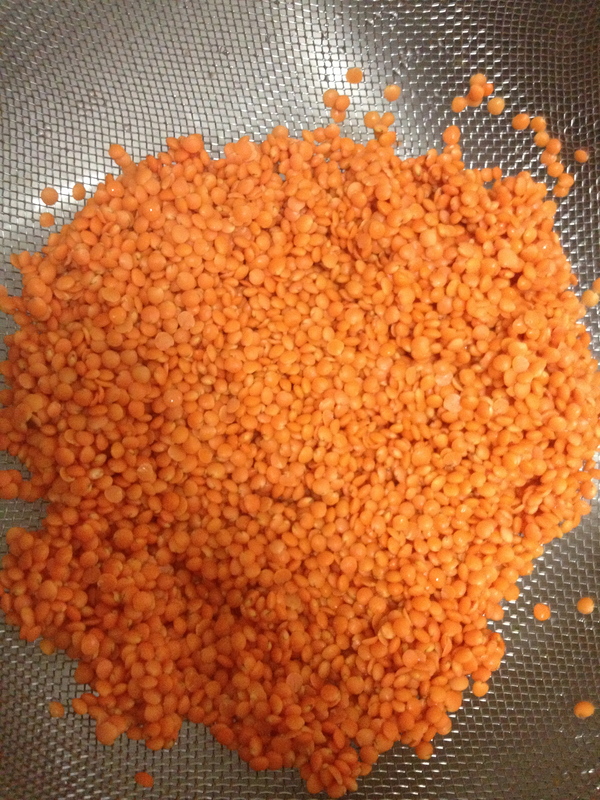 Lentils are a great source of protein- about 30% of their calories come from protein which makes them the third highest legume in protein content. 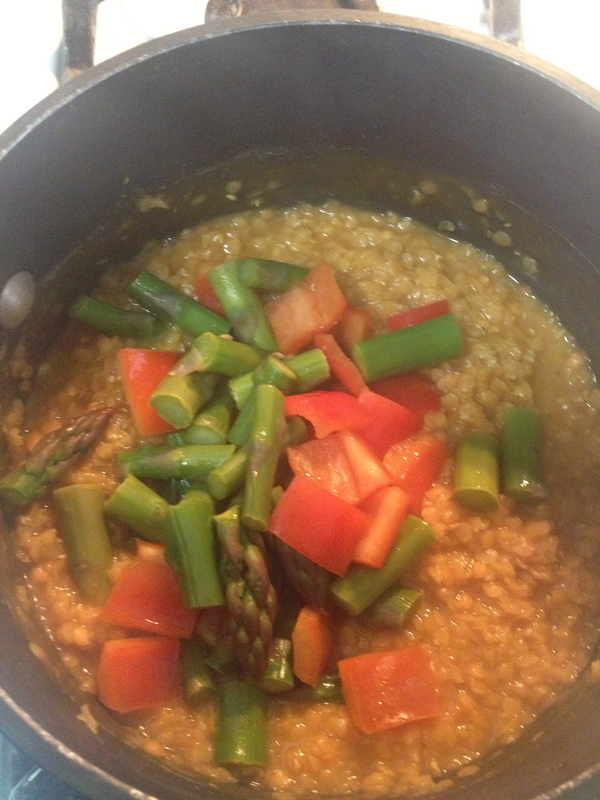 Adding some fresh veggies is the perfect way to get a well-rounded meal that keeps in the fridge for a few days! 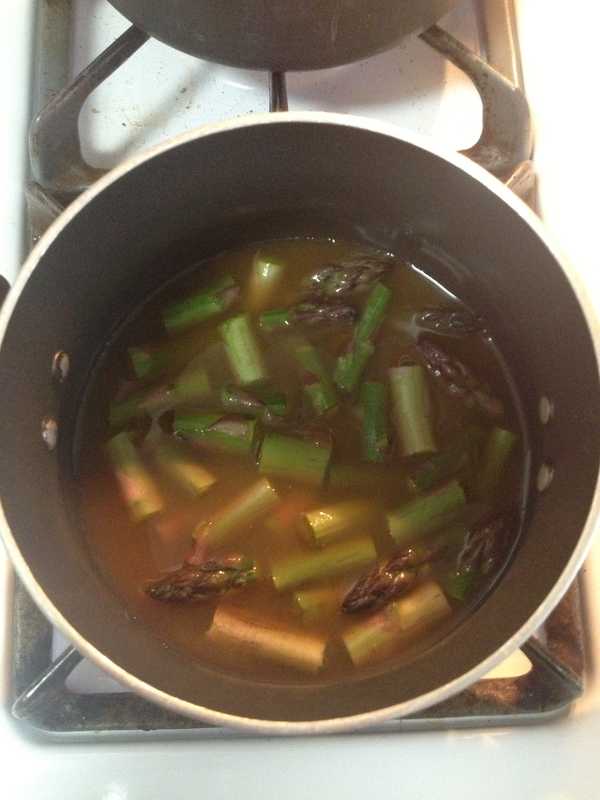 I had some vegetable broth left over from making the WW Asian-Inspired soup a while back that I was able to pull out of the freezer and use instead of water while cooking the lentils. 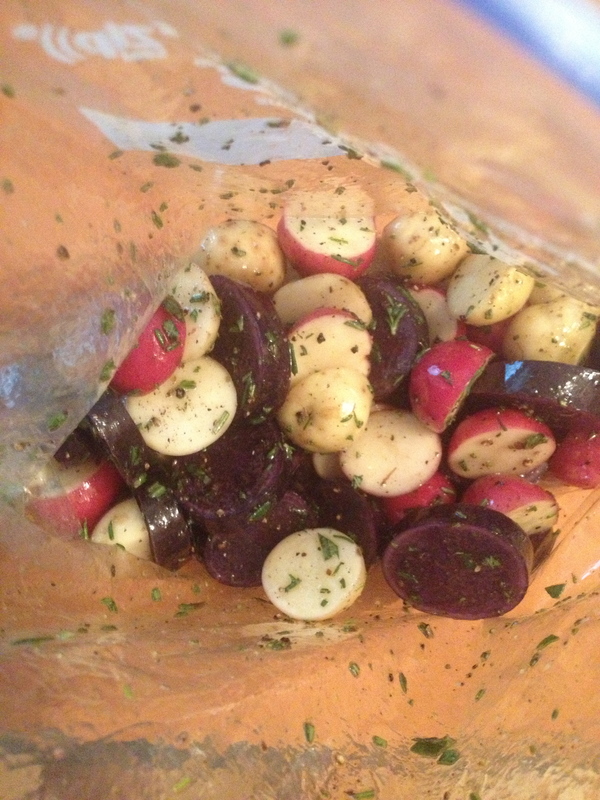 This is also a great way to use up extra veggies you have in the fridge! 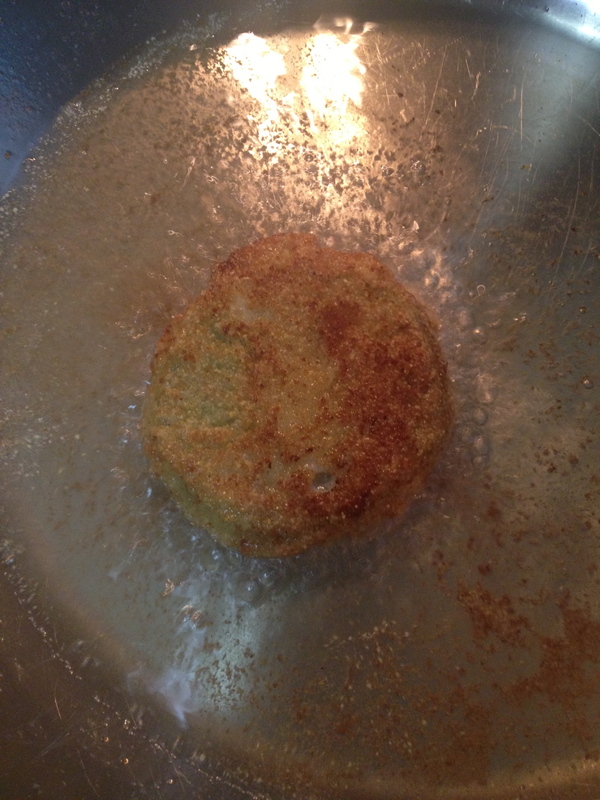 I mentioned yesterday that Nick and I bought green tomatoes on Monday so I decided to tackle making fried green tomatoes for the first time ever! I did some research (as always) before choosing a simple recipe from a blog called “Pretty Tasty Things.” I pretty much left this recipe alone other than adding in a little cayenne to the flour for some extra heat. 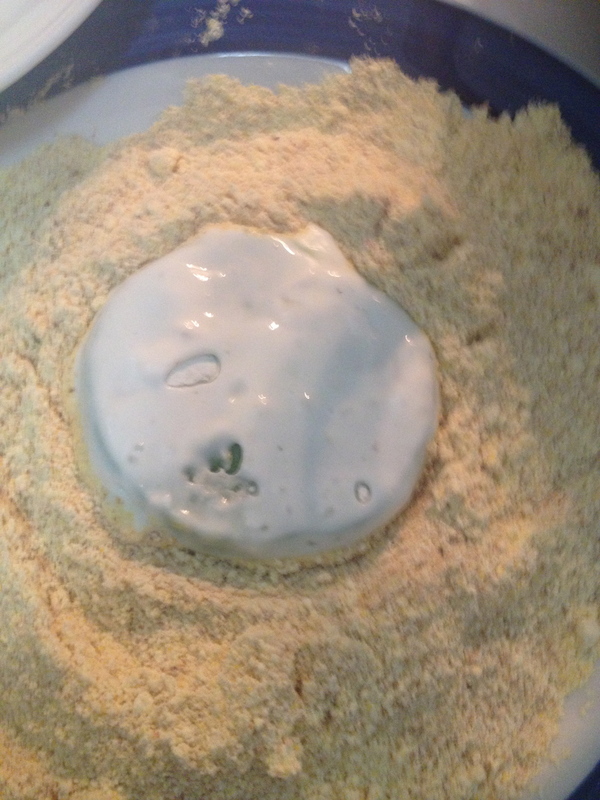 Whenever I batter and fry anything (which isn’t all that often), I look for a batter that uses flour and buttermilk as part of the dredging process. The flour is a perfect first step because it helps coat whatever you are frying so you get a true batter around everything. 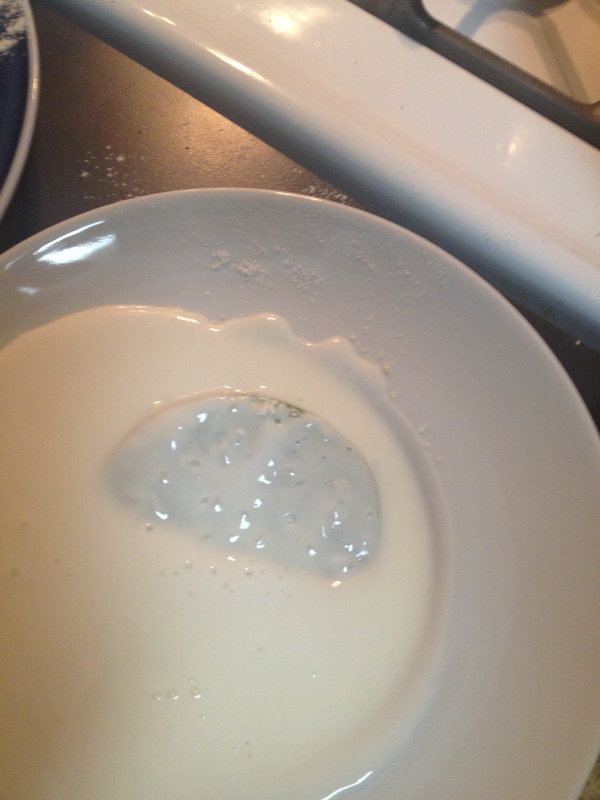 The buttermilk helps create the next step of the barrier and gives the outside layer some moisture to adhere to. 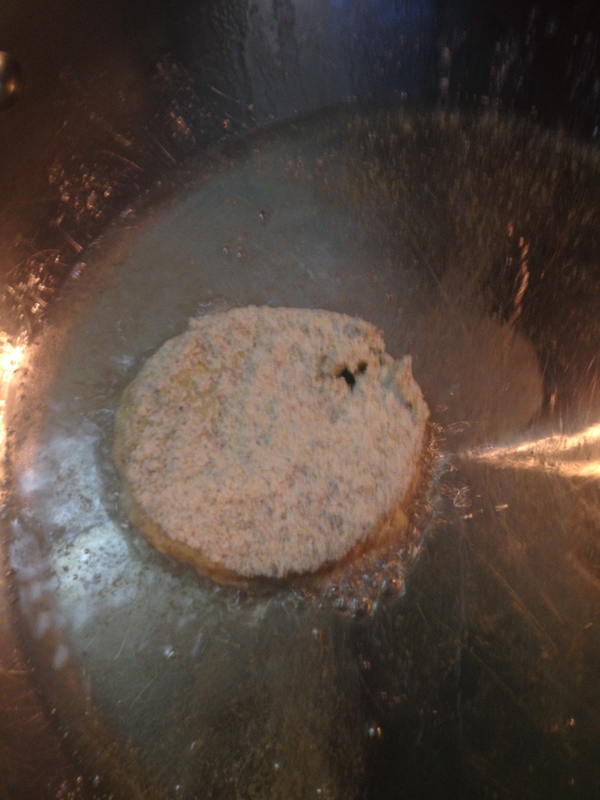 The cornmeal and bread crumb outer layer creates a crunchy bite. 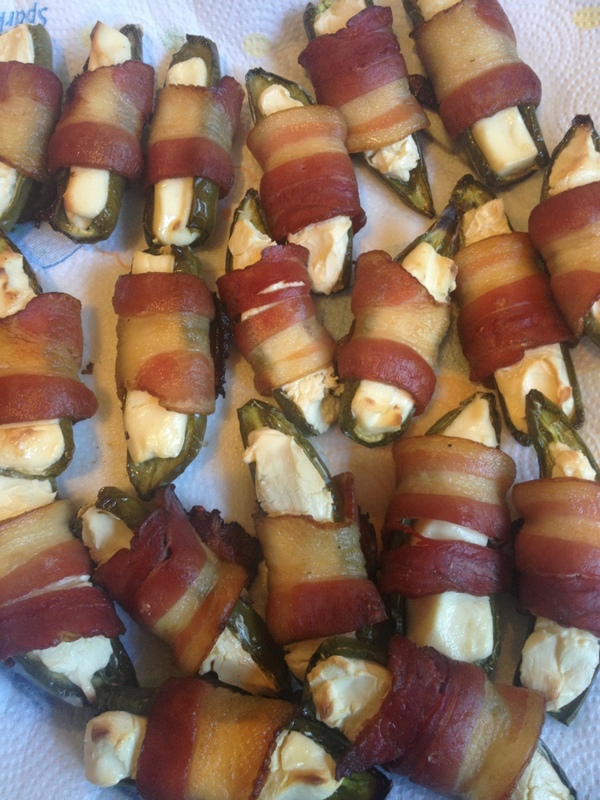 So when I saw these in this recipe, I had to try it! This recipe is relatively easy but the dredging can be a little tricky. I found using a fork to flip, cover and move the tomato slices from bowl to bowl was the easiest way. You can use your fingers but be careful to use one hand for the dry ingredients and one hand for the wet ingredients so you don’t end up with a gloppy mess! 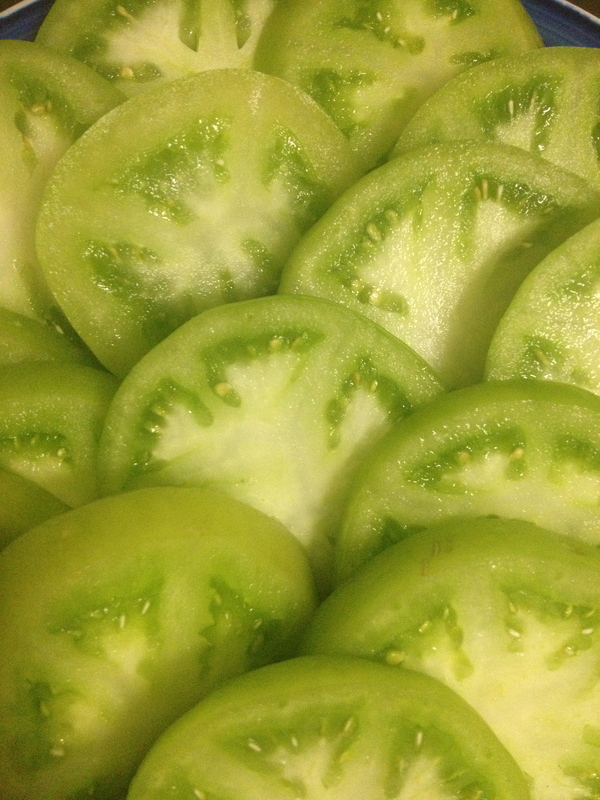 Rinse and pat dry the green tomatoes. Slice the tomatoes into 1/4-inch thickness. Season both sides with salt. 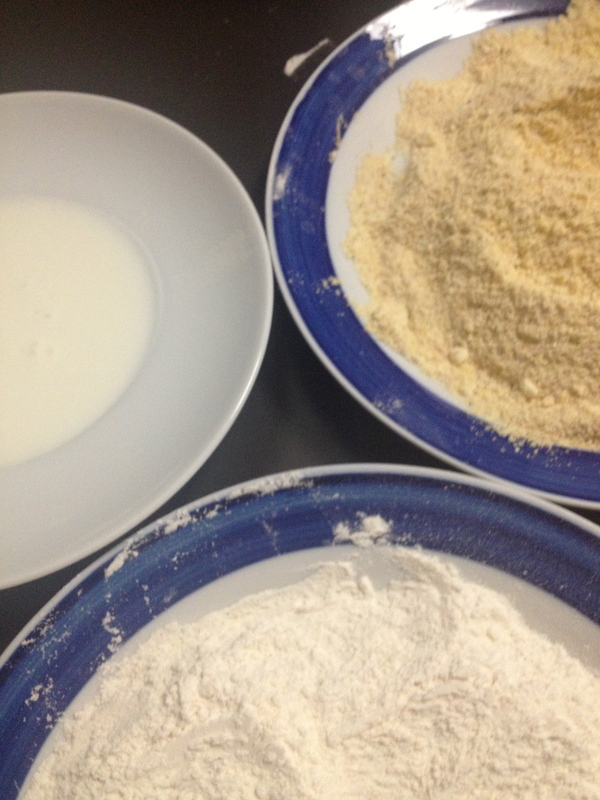 In three separate bowls, add flour to the first one with some salt and pepper, buttermilk to the second, and combine the breadcrumbs and cornmeal in the third. Taking a slice of tomato, lightly coat it in the flour, coat both sides with the buttermilk and then dredge into the breadcrumb/cornmeal mixture. Repeat process for all the slices. Heat a large skillet on medium heat with vegetable oil about 1/4-inch high. Once the oil is hot, gently place 5-6 slices into the pan. Let one side turn golden brown, about 2-3 minutes per side, before turning it over. Remove and place on a baking rake to drip the excess oil. I kept mine in the oven until all the slices were fried (at 170 degrees). 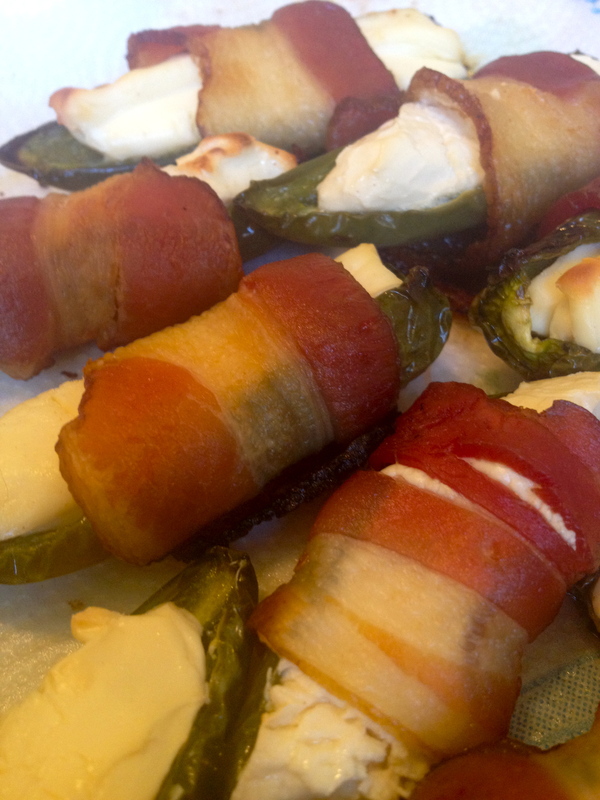 Don’t forget to try them with the buttermilk ranch dressing from yesterday’s post! Place on a broiler rack that has been coated with cooking spray. Bake at 350° for 20-25 minutes or until bacon is crisp (I put them under the broiler for an additional 2 minutes to get the bacon extra crispy). Remove toothpicks. Serve immediately. I mentioned last week that I ventured down to Chinatown to get some groceries to make Vietnamese food. Well here is the post (finally!). I apologize for not getting it up sooner- I need a little break from the computer but I have lots of fun stuff to post this week from my culinary adventures this weekend. Lauren and Colleen are my two closest girlfriends in New York. I see Lauren regularly (it’s not unusual to see her more than I see my boyfriend in a week) but it had been a while since the three of us had had a girls night together. 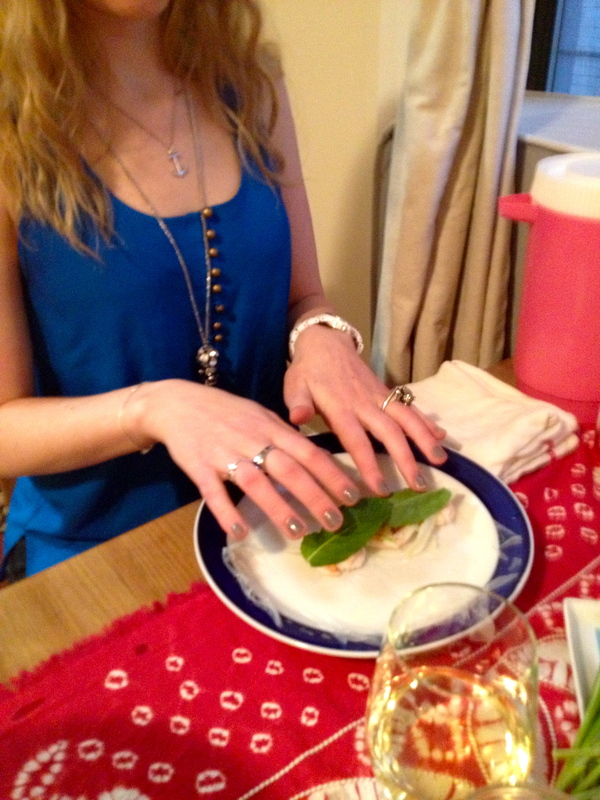 I invited them over to teach them how to make an easy Vietnamese appetizer and to enjoy some wine and dragon fruit. All I did was prep everything before they got there and had it all set up on the table for whenever they wanted to sit down and eat. 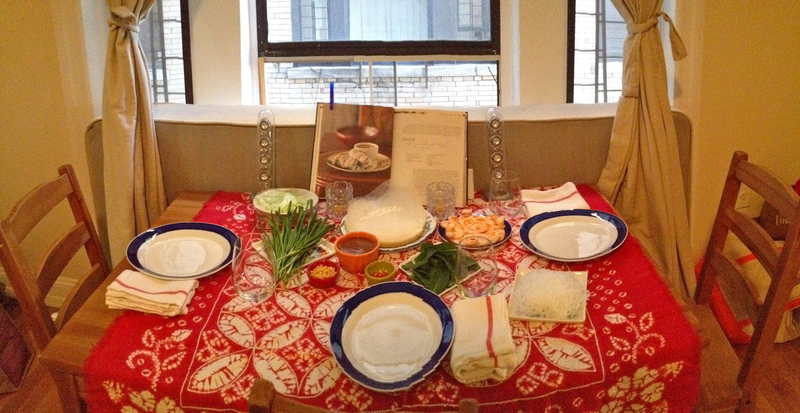 I made Goi Cuon from this cookbook once in college and it can be kind of labor intensive because you have to be patient with each and every roll. Honestly, after that first time I felt kind of defeated until I tasted them. The work is worth it! I also noticed what a difference the proper ingredients make. I know it can be hard to find garlic chives (very different flavor than a regular chive), Asian mint (it’s a lot spicier than regular mint) and perilla (also called shiso). You will definitely need to find an Asian market for the vermicelli and rice paper (unless your grocery store has an extensive international foods section) but the herbs can still be hard to find. 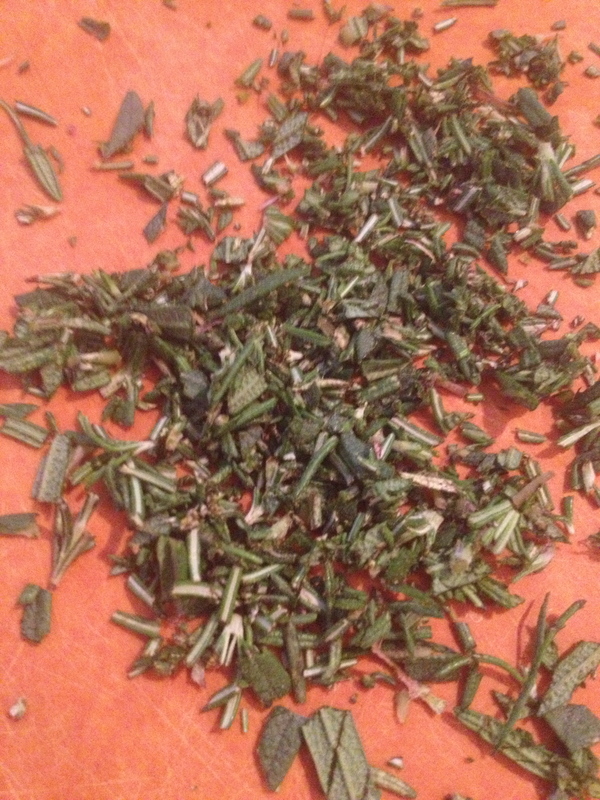 If you are in a bind, just grab regular chives and mint and skip the shiso (I didn’t add any in when I made them). The flavors will be a little different but still delicious! I hope you will try to make these at home. They are beautiful to set out for a dinner party and will be sure to impress everyone! And, I promise, once you’ve made them twice, you will have the process memorized and it will feel like a breeze every time after that! Add noodles to boiling water and bring back to a boil. Cooke for 5 minutes. Turn off the hear and allow the noodles to stand in the water for an additional 5 minutes. Strain and rinse under cold water, then leave to dry. For this recipe, it is best to have cooked and strained the vermicelli at least 30 minutes prior to rolling. This allows the noodles to dry off a little and stick together. 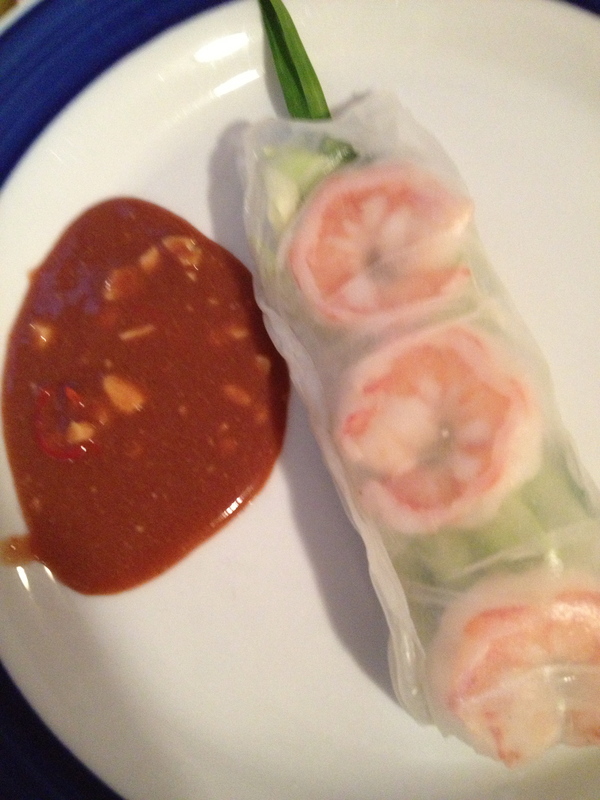 To assemble the rolls, cut six sheets of rice paper in half. Fill a large bowl with warm water and dip one whole sheet of rice paper in the water until it softens, then lay it flat on a plate. 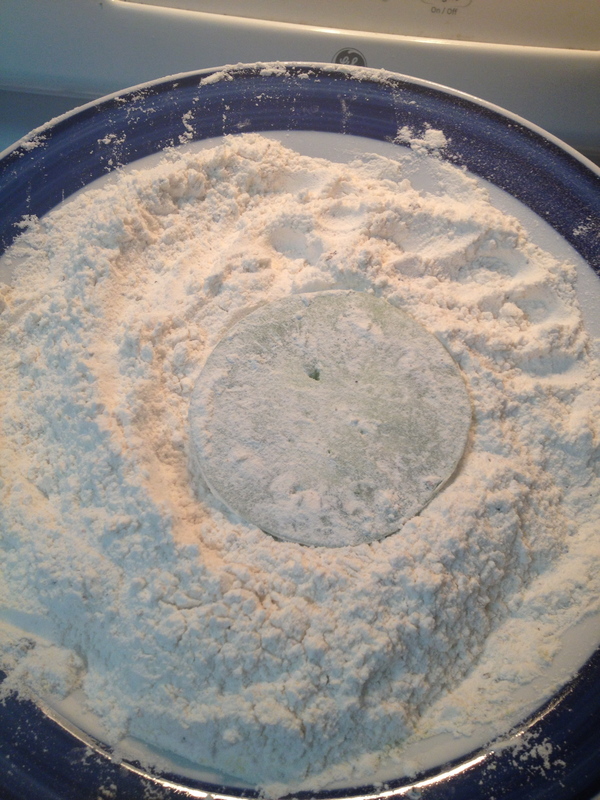 Dip a half sheet of rice paper in the water and lay it vertically in the middle of the round sheet. 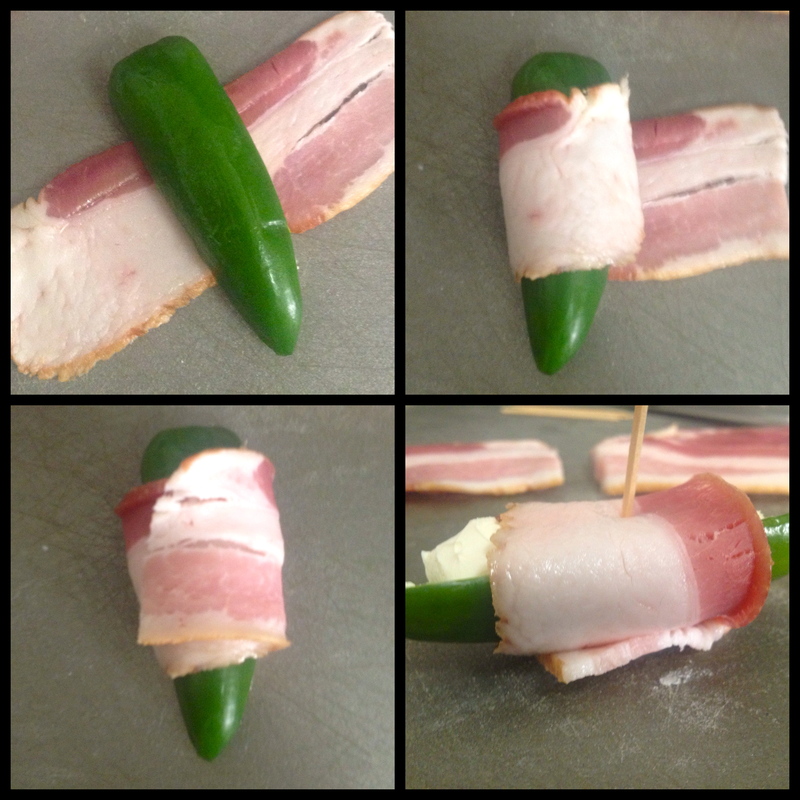 This will help strengthen the roll and keep the filling from breaking through. 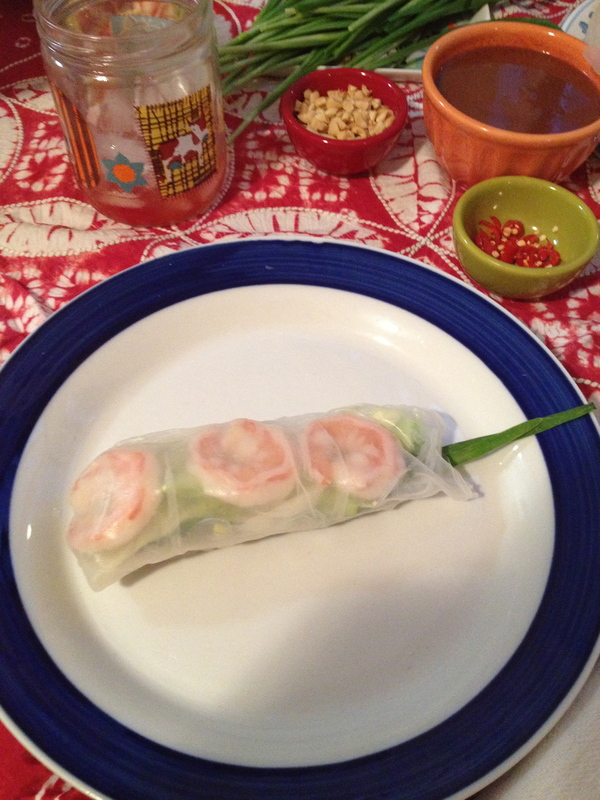 In the middle of the rice paper, place three pieces of shrimp in a horizontal line approximately 1 1/2 inches from the top. Below the shrimp, add some pork, lettuce, perilla, mint, and vermicelli. 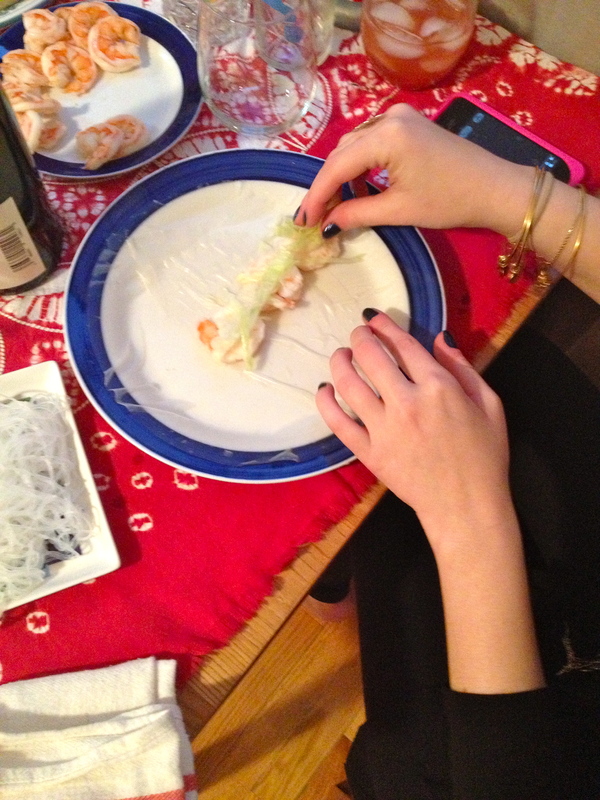 To form the goi cuon, first fold the sides into the center over the filling, then the bottom of the paper up and over. 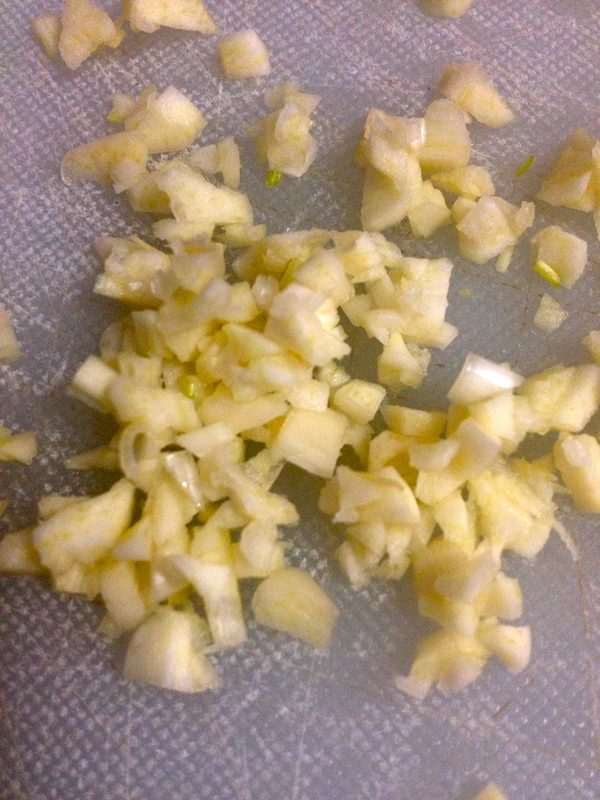 Roll from bottom to top to form a tight roll, and just before you complete the roll add two pieces of garlic chive so that they stick out at one end. *I do not use the pork neck. I find that they are just as delicious (just not as authentic) without it and it saves some points! 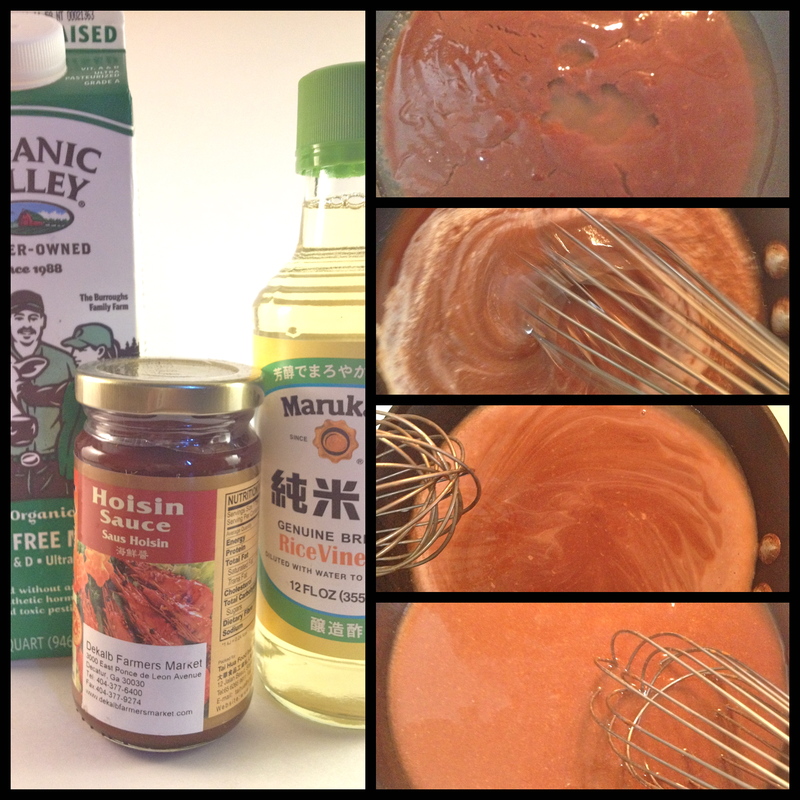 In a saucepan, combine the hoisin sauce and the rice vinegar, place over medium heat and stir in the milk. 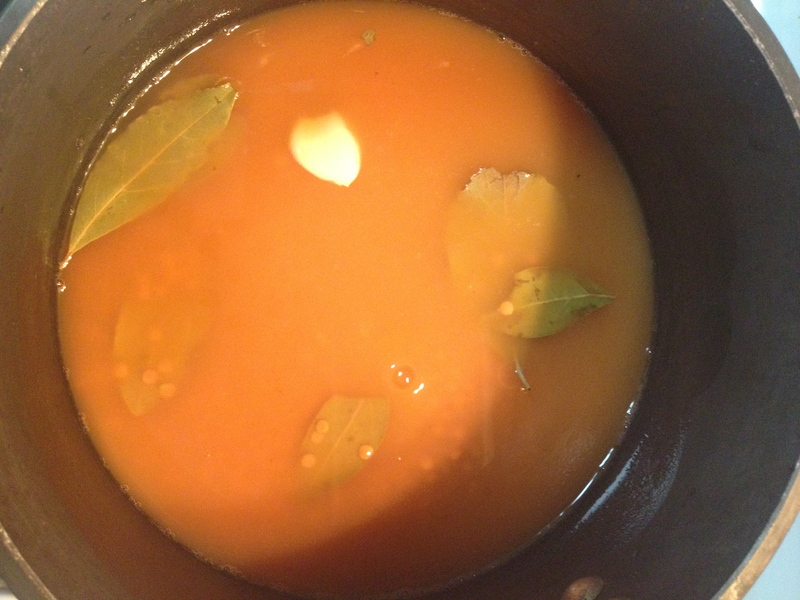 Continue to stir until just before boiling point is reached, then allow to cool. 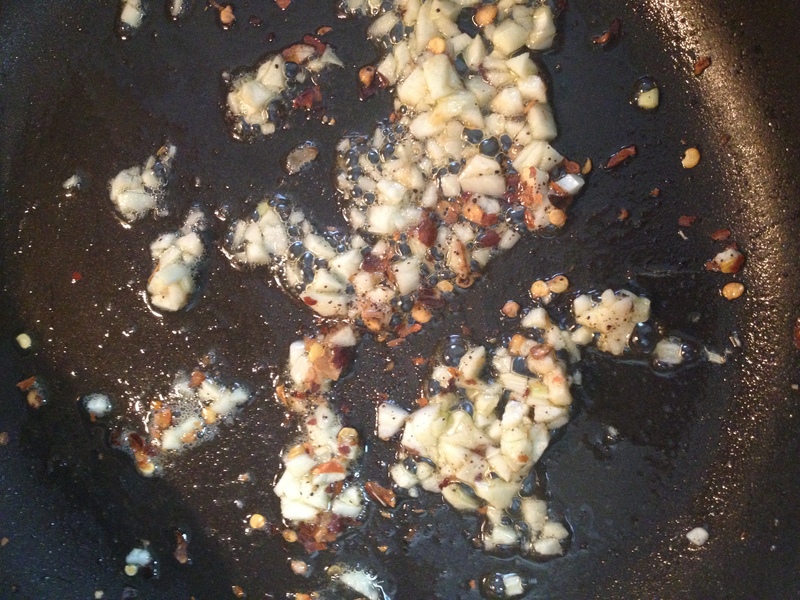 To serve, chop the roasted peanuts and finely slice the chili to garnish the sauce. 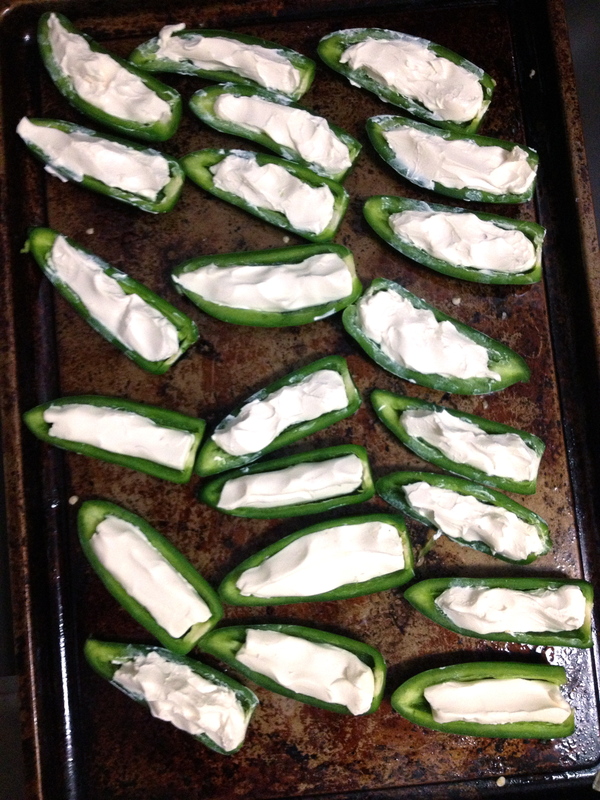 The dipping sauce will last up to one week stored in the refridgator. 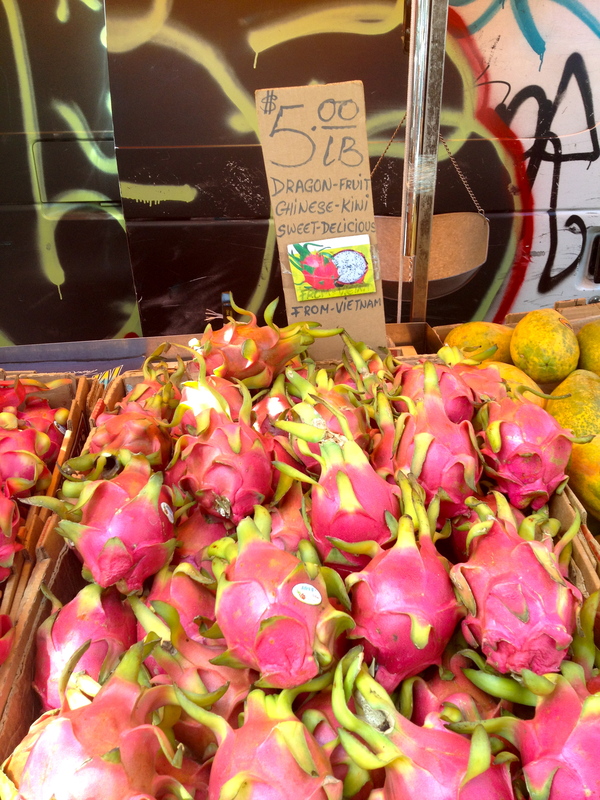 And here are pictures of the dragon fruit stand in Chinatown and it all cut up for dessert. 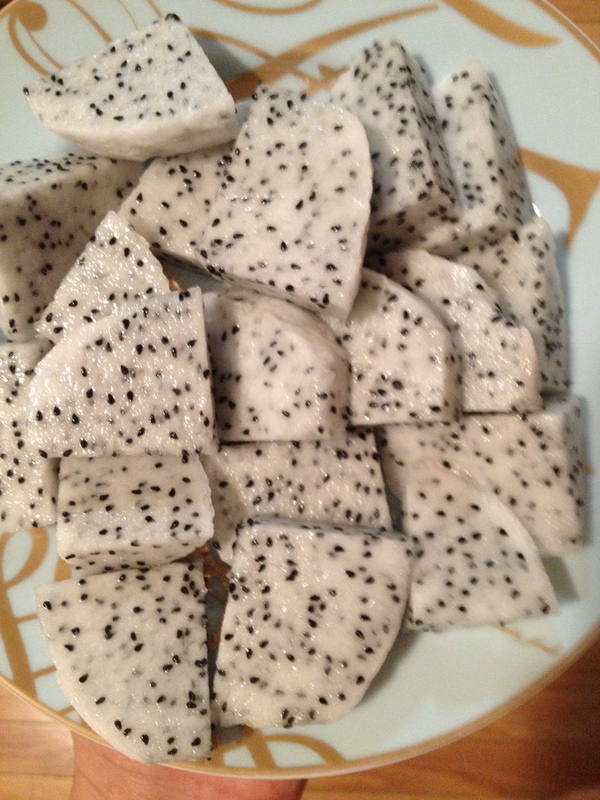 I ate dragon fruit almost every day for breakfast when we lived in Vietnam. Think kiwi meets pear meets watermelon. It’s mild, not too sweet and very hydrating and refreshing! The biggest difference between dragon fruit in NYC and Vietnam? Price. I got one fruit for $6 in Chinatown whereas the same fruit would have cost about 45 cents on the streets in Saigon! Sorry I didn’t get a chance to post yesterday! This weekend is full of friends and work so the posts may be sparse. Here’s a little something to check out while I work on getting a post together about the Vietnamese food my friends and I made on Thursday! 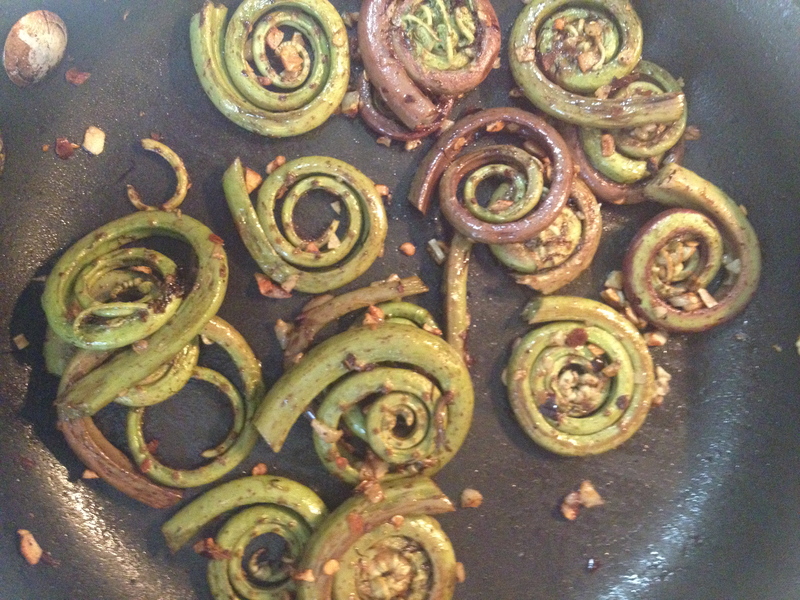 Fiddlehead ferns are very sought after in the culinary world. They are not usually cultivated but rather harvested by individuals. They have a very short season of only a few weeks in the early spring. I have had them a few times before but had never cooked them before yesterday! Like most fresh, seasonal produce, you don’t have to do a whole lot to make them taste delicious. 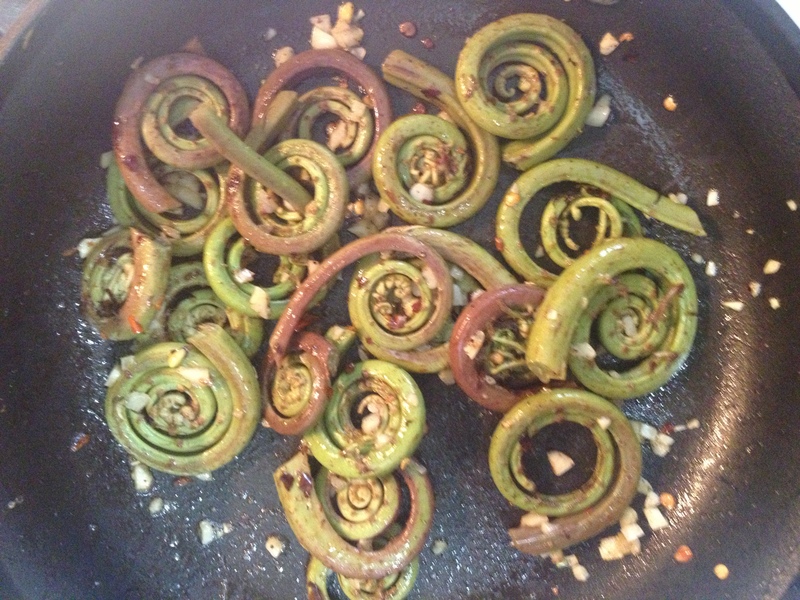 Wash the fiddleheads by putting them in a colander and dunking it into a bowl of cold water. Swish them around a little bit to make sure you get rid of any dirt that may be caught in the spiral. Remove the colander from the water. Fill a pot with cold water and pour the fiddleheads into the cold water. 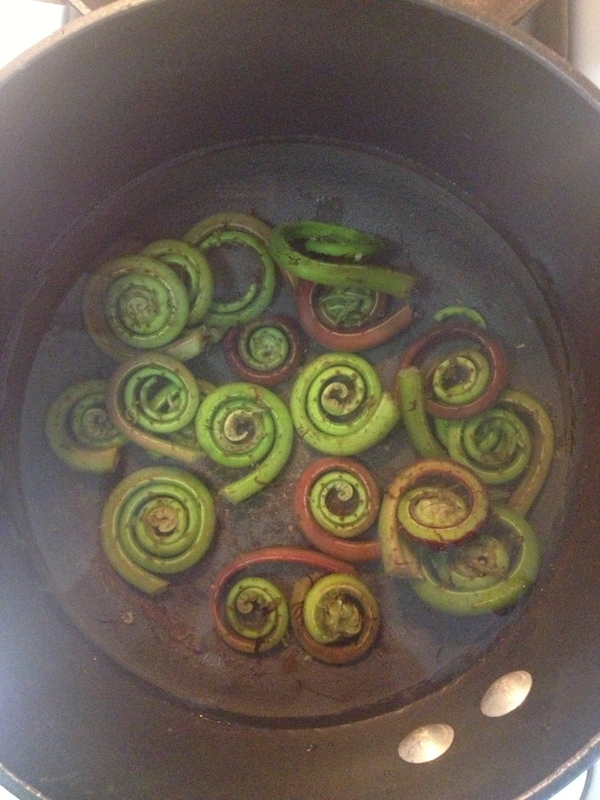 Bring to a boil and cook the fiddleheads until they all raise to the surface (about 5 minutes). Serve with your protein of choice! *the only points come from the oil so you can eliminate this by using a PAM spray if needed. 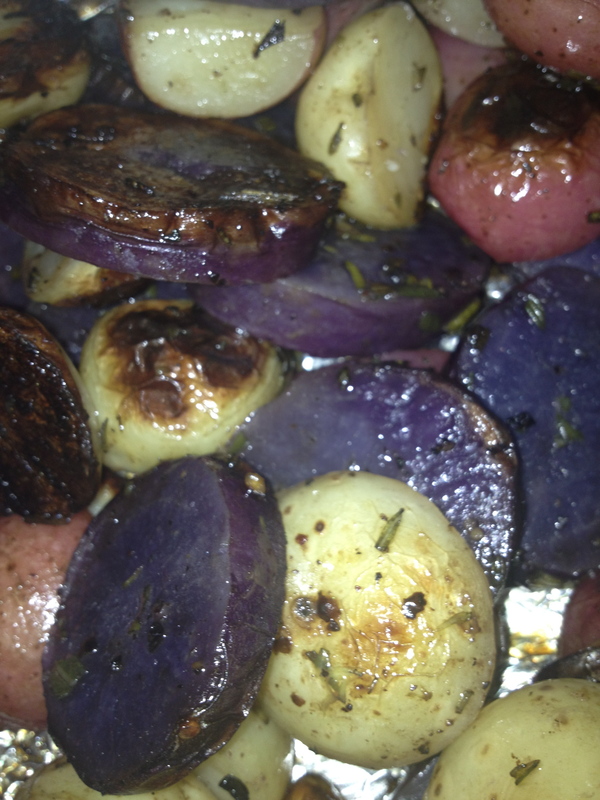 I posted a picture Thursday night of the creamer potatoes I made for dinner at my parents. This is such a simple side dish and this is an inexpensive way to make a meal look extra fancy. 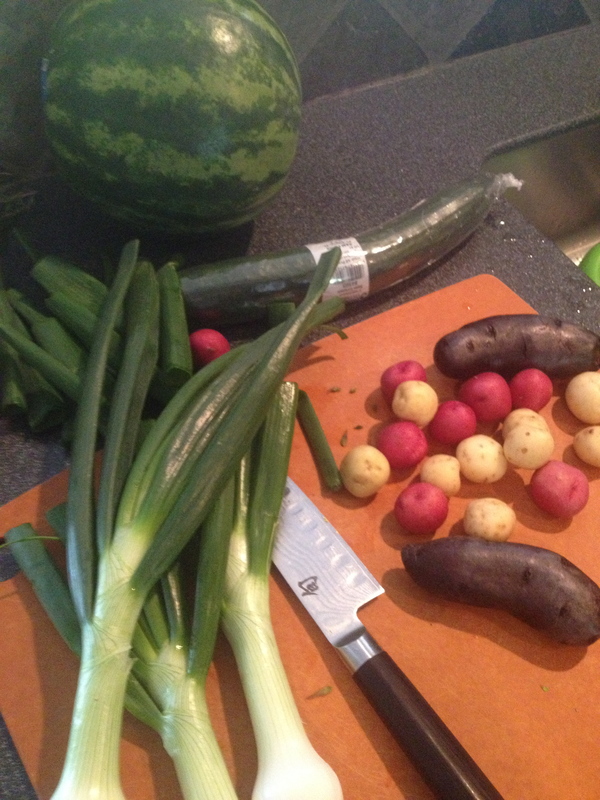 When my mom and I were at the Dekalb Farmer’s Market Thursday afternoon, I stumbled upon a medley of small potatoes. I am a firm believer that you eat with your eyes first and, therefore, anything you can do to make your food look pretty will also help it taste better! 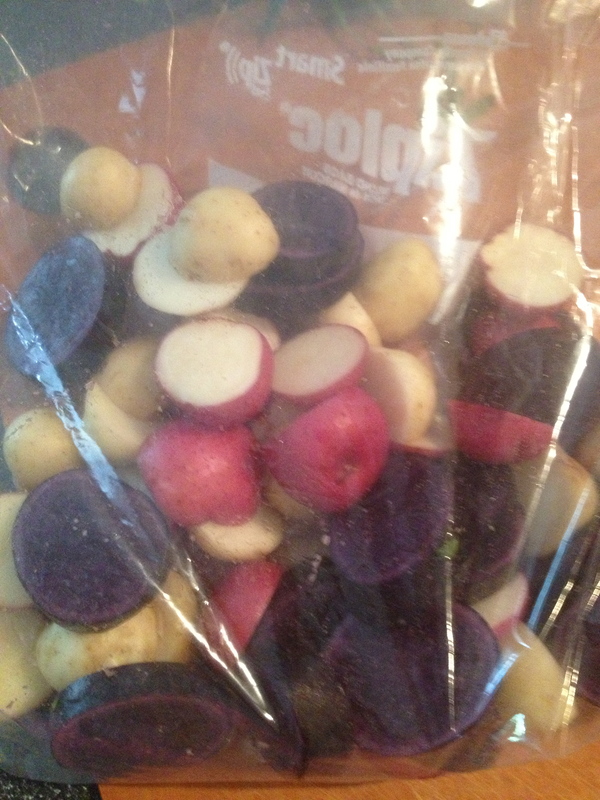 I noticed some tiny red and white creamer potatoes sitting next to some long, thin, purple fingerlings. I grabbed about a 1/2 pound of each. All of them cost less than a dollar per pound! 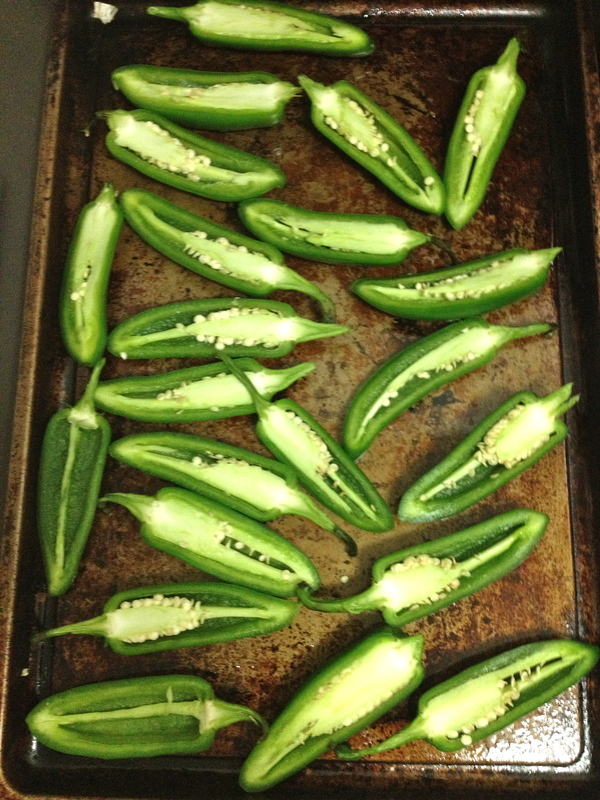 Preheat the oven to 400 degrees or turn your grill on to medium high heat. Wash and scrub your potatoes to get rid of any excess dirt. Make sure to dry them completely. Cut the potatoes so that they are all roughly the same size. 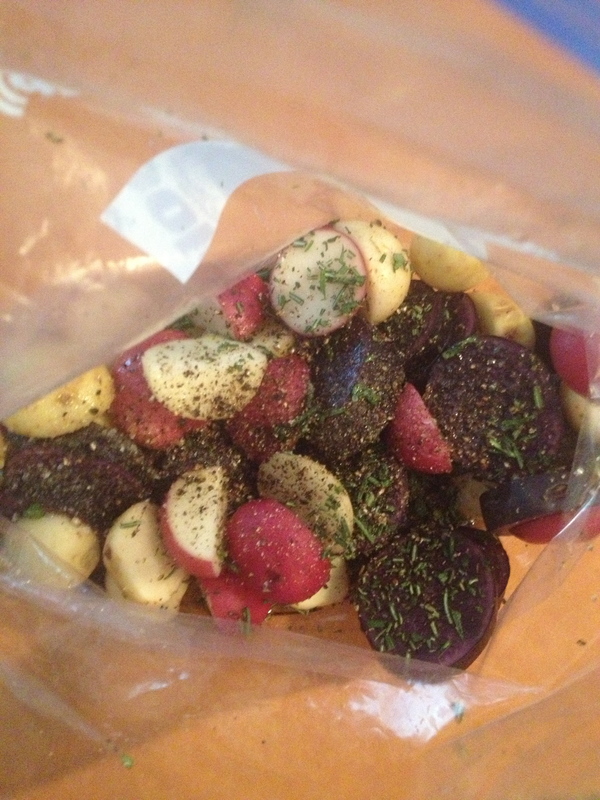 Put all the potatoes in a large zip lock bag. Add roughly 1 tbsp of oil to the bag. You may need a little more. All the potatoes should have a nice coating of oil on them. Finely chop the fresh rosemary and add to the bag. 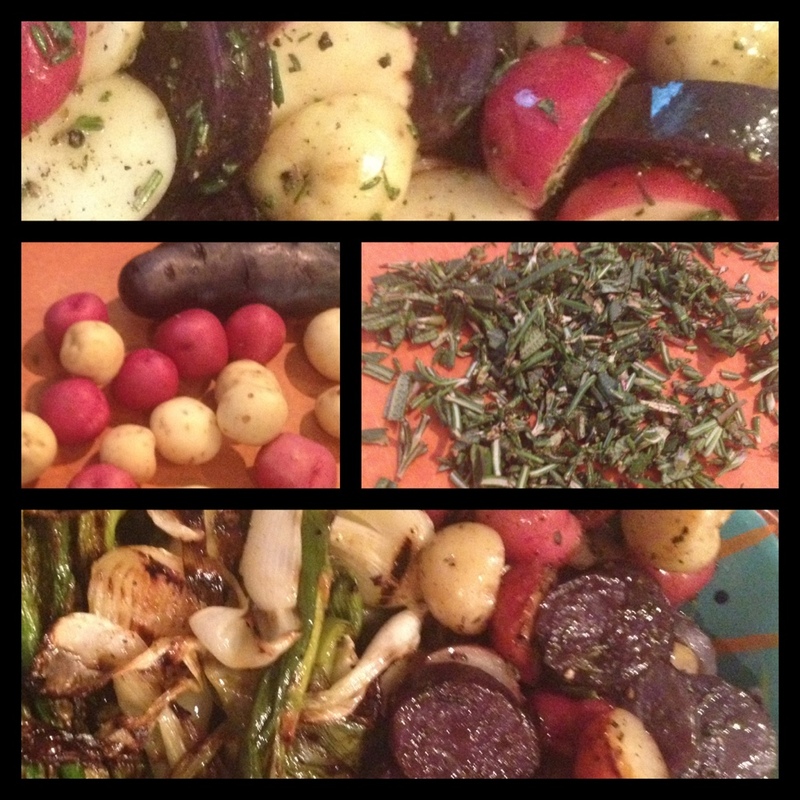 Shake vigorously until the rosemary, salt and pepper evenly coat the potatoes. Gently pour the potatoes onto a sheet of tin foil (the sheet should be long enough for all the potatoes to lay flat and have about 2 inches of extra foil around all the edges). 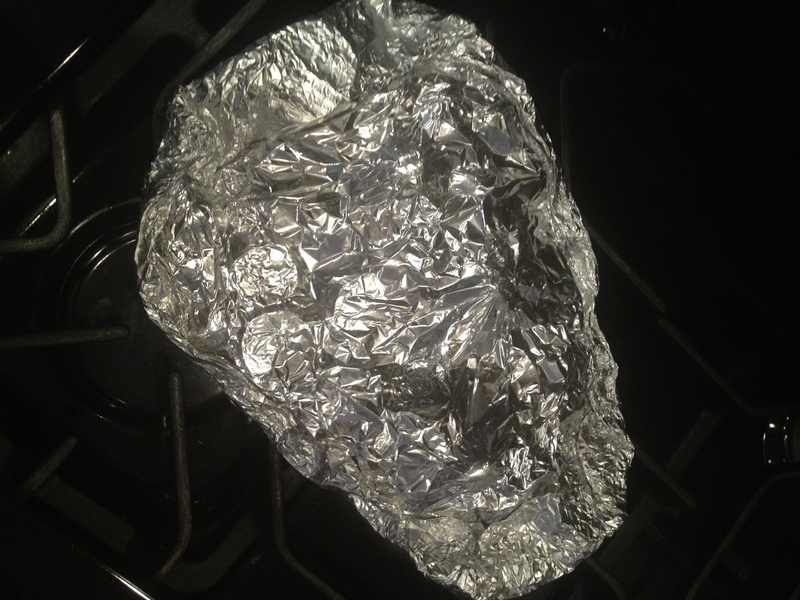 Top the potatoes with another sheet of foil and fold the sides over to make a little packet of potatoes. 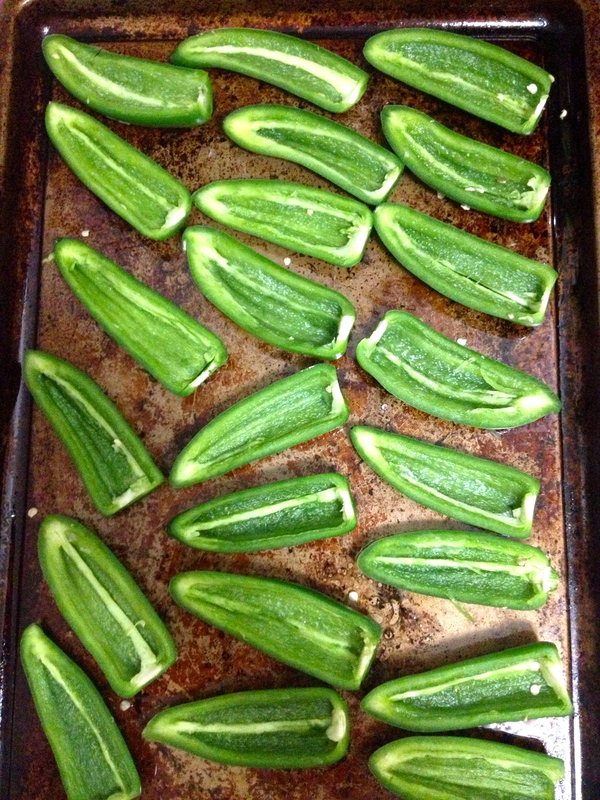 Place the foil packet directly on the oven rack or on the lower level of your grill. Check after 30 minutes (could take up to 45). The potatoes should be tender but not falling apart. I grew up eating artichokes in California and this is a great, approachable way to prepare them. Definitely melt some butter or make a garlic aioli for dipping!